ensuring that reflection is part of the routine. These trends are impacted by the effective application of educational technologies in teaching and learning spaces and places. For a look at educational trends, read the blog post 2014:One Educator's Year in Review written by Vicki Davis, posted on Edutopia. Teaching and learning in today's Ontario classrooms require that a teacher become digitally aware, become involved in affinity spaces, become a tinkerer to create knowledge and apply their own learning to their work in the classroom. Your role as a future educator will be to apply and integrate digital literacy by accessing, analyzing, creating, reflecting and taking action with web 2.0 tools. 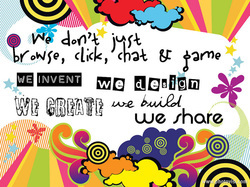 This message is emphasized in the Innovation in Action video presented on the Edugains website. This newsletter (21st Century Teaching and Learning: Winter 2014 Quick Facts) provides information about the current status of educational technology initiatives in Ontario. Exploring further into each school district's initiatives is available on this list. How Videogames like Minecraft Actually Help Kids Learn to Read, Clive Thompson, Oct. 9, 2014. Gamify Learning: 20+ Resources, posted by Shelly Terrell, April 15, 2014. Gamifying Education: Do We Really Know How to Gamify the Classroom? posted by Vicki Davis, Feb. 12, 2014.